Mediterranean Kitchen by Austin Architects & Building Designers Vanguard Studio Inc. The natural stone you have purchased for your home or office is an investment that will give you many years of beautiful service. This natural stone countertop care and cleaning guide will help you preserve your granite and natural stone’s beauty for generations to come. This guide offers routine cleaning guidelines as well as procedures for stain removal should it become necessary. Use coasters under all glasses, particularly those containing alcohol or citrus juices. Many common foods contain acids that can dull or etch the surface of many stones. Use trivets or mats under hot dishes and placemats under china, ceramics, silver, or other objects that can scratch the surface. 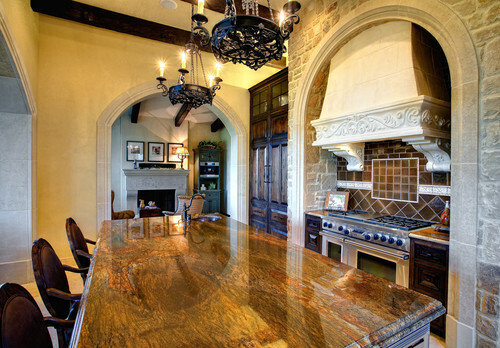 The simplest means of caring for granite is cleaning. Clean stone surfaces with a neutral cleaner, stone soap, or mild dishwashing detergent and warm water. Too much cleaner or soap may leave a film. Do not use products that contain lemon, vinegar, or other acids on marble or other calcareous stones. Rinse the surface thoroughly after washing with the soap. Do not use scouring powders or creams; these products contain abrasives that may scratch the stone. Tops may need to have a penetrating sealer applied. Natural stone can be classified into two general categories depending on its composition: siliceous or calcareous. Knowing the difference is critical when choosing cleaning products. Siliceous stone is composed mainly of silica or quartz-like particles. It tends to be very durable and relatively easy to clean with mild acidic cleaning solutions. Examples of siliceous stone include granite, slate, sandstone, quartzite, and bluestone. Calcareous stone is composed mainly of calcium carbonate. It is sensitive to acidic cleaning products and may require different cleaning procedures than siliceous stone. Examples of calcareous stone include marble, travertine, limestone, and onyx. Blot any spill with a paper towel immediately. Don’t wipe the area, it will spread the spill. Flush the area with plain water and mild soap and rinse several times. Dry the area with a soft cloth. Repeat as necessary. If the stain remains, refer to the following sections in this guide. An oil-based stain will darken the stone and normally must be chemically dissolved so the source of the stain can be flushed away. Clean gently with a soft, liquid cleanser with bleach OR household detergent OR ammonia OR acetone OR mineral spirits. May cause a pinkish-brown stain and may disappear after the source is removed. Clean with 12% hydrogen peroxide (hair bleaching strength) and a few drops of ammonia. Iron or rust stains are orange to brown in color and follow the shape of the staining object. Copper and bronze stains appear as green or muddy-brown and result from the action of moisture on nearby embedded bronze, copper, or brass items. Metal stains must be removed with a poultice. (See section of Making & Using a Poultice). Deep seated, rusty stains are extremely difficult to remove and the stone may be permanently stained. Clean with dilute (1/2 cup in a gallon of water) ammonia OR bleach OR hydrogen peroxide. DO NOT MIX BLEACH AND AMMONIA! THIS COMBINATION PRODUCES A TOXIC AND LETHAL GAS! Small amounts can be removed with lacquer thinner or scraped off carefully with a razor blade. Heavy paint coverage should be removed only with commercial “heavy liquid” paint stripper available from hardware stores and paint centers. These strippers normally contain caustic soda or lye. Do not use acids or flame tools to strip paint. Paint strippers can etch the stone surface. Follow the manufacturer’s directions taking care to flush the area thoroughly with clean water. Protect yourself with rubber gloves and eye protection. Work only in well ventilated areas. Normally, latex or acrylic paint will not cause staining. Oil based paints, linseed oil, putty, caulks and sealants may cause oily stains. Surface scratches may be buffed with dry 0000 steel wool. Deeper scratches and nicks should be repaired and re-polished by a professional. Sometimes stone top care requires removing stains with a poultice. A poultice is a liquid cleaner or chemical mixed with a white absorbent material to form a paste about the consistency of peanut butter. The poultice is spread over the stained area to a thickness of about ½” with a wood or plastic spatula, covered with plastic, and left to work for 24 to 48 hours. The liquid cleaner or chemical will draw out the stain into the absorbent material. Poultice procedures may need to be repeated to completely remove a stain. Poultice materials include kaolin, fuller’s earth, whiting, diatomaceous earth, powdered chalk, white molding plaster or talc. Approximately one pound of prepared poultice material will cover one square foot. Do not use whiting or iron-type clays such as fuller’s earth with acid chemicals. The reaction will cancel the effect of the poultice. A poultice can also be prepared using white cotton balls, white paper towels or gauze pads. Poultice with one of the powdered poultice materials and 12% hydrogen peroxide (hair bleaching strength) OR use acetone instead of the hydrogen peroxide. Poultice with diatomaceous earth and a commercially available rust remover. Rust stains are particularly difficult to remove and may require a professional. Poultice with one of the powdered poultice materials and ammonia. Biological Stains. Poultice with dilute ammonia OR bleach OR hydrogen peroxide. DO NOT MIX BLEACH AND AMMONIA! THIS COMBINATION PRODUCES A TOXIC AND LETHAL GAS! Prepare the poultice. If using powder, mix the cleaning agent or chemical to a thick paste the consistency of peanut butter. If using paper, soak in the chemical and let drain. Don’t let the liquid drip. Wet the stained area with distilled water. Apply the poultice to the stained area about ¼ to ½ inch thick and extend the poultice beyond the stained area by about one inch. Use a wood or plastic scraper to spread the poultice evenly. Cover the poultice with plastic and tape the edges to seal it. Allow the poultice to dry for about 24 to 48 hours. The drying process is what pulls the stain out of the stone and into the poultice material. After about 24 hours, remove the plastic and allow the poultice to dry. Remove the poultice from the stain. Rinse with distilled water and buff dry with a soft cloth. Use the wood or plastic scraper if necessary to lift the poultice off the stain. Repeat the poultice application if the stain is not removed. It may take up to five applications for difficult stains. Following the above Natural Stone Countertop Care and Cleaning procedures and precautions will help you maintain a beautiful finish to your tops.